The figure schematically shows the organizational structure of Better Biomass. 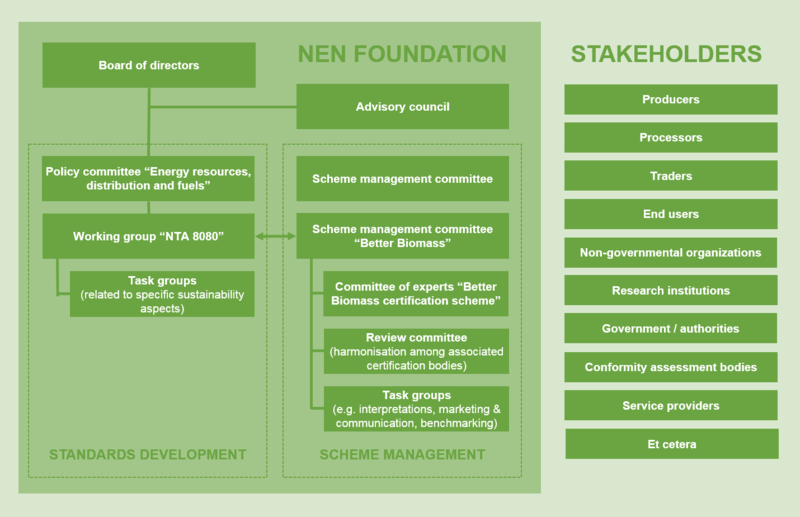 This page provides more information about the composition of the Working group “NTA 8080”, the Committee of experts “Better biomass certification scheme”, and the Scheme management committee “Better Biomass”. 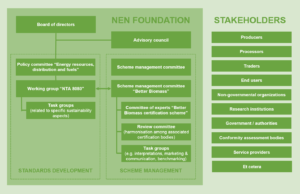 More information about the governance of schemes that are managed by NEN is available in the NEN Scheme management manual. More information about NEN as not-for-profit organization is available at the NEN website. As part of the standards development process, a draft version has been published for public consultation that have attracted input from several experts across the world. As part of the certification scheme development process, a draft version of the scheme was used in pilot projects for validation. Some pilot projects took place in the framework of a Green Deal Green certificates for application of biomaterials in chemical products and plastics. NEN together with their stakeholders is in the process of restructuring the scheme management committee.